pale girl camo / outfit of the day on fashion friday / hello, rigby! on wednesday, i mentioned how i realized how pale i am over the weekend, and even made up a phrase: pale girl camo. well, here’s the outfit that really spelled out how pale i truly am. my dermatologist would be super proud of me right about now. midi skirts are something i’ve heard are terrible for us petite people. i say whatever to that. wear what you like, even if its not the absolute most flattering thing in the world. i have a couple of tough spots – i’m short (5’3″) and i also have a short torso. it makes it a bit of a challenge when it comes to shopping sometimes, but i always dig a high waisted look. 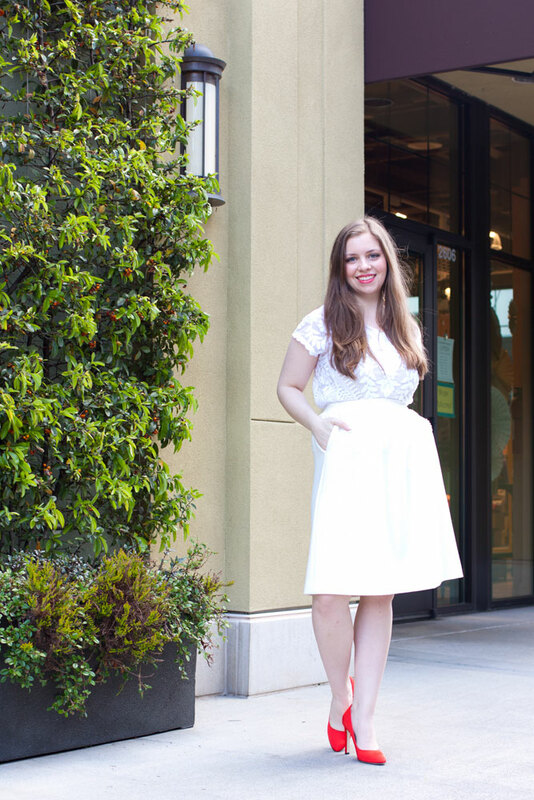 the thing that really sold me on this midi skirt? those pockets. there’s nothing better to me than a dress or skirt with pockets. seriously, you can put things in there! your hands, instead of awkwardly trying to pose them during outfit photos. your phone… and then you’ll forget you have pockets in your skirt and panic because you can’t find it. yeah, i would never do that. oh and these shoes. you may remember them from when I met Sarah Jessica herself. the bottoms are even signed! swoon. as you can see, the wind provided an interesting effect on my hair in some of these photos. not to mention the onlookers that were trying to maneuver around us when we were taking these shots. a big thank you Sarah for taking these for me! 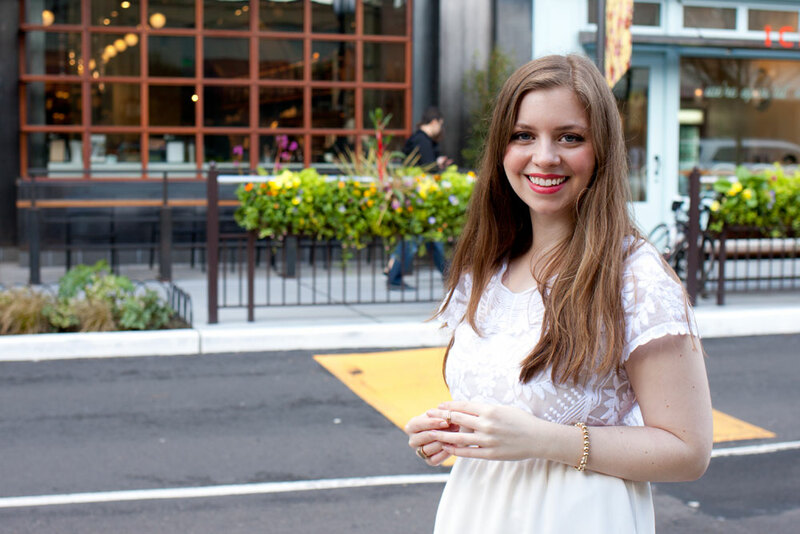 oh the life of a personal style blogger, its awkward and fun all at the same time. I think you look lovely, very ethereal, and the splash of colour is a masterclass. Also so with you on skirts with pockets! I think the skirt looks great on you. Petite girls can wear midi skirts, as you are proof. The whole look is very beautiful. Happy Weekend! Aw yay! I’m glad the pictures turned out so cute! This outfit is sensational! SO chic! I love the length on you and these shoes make me want to be fashionable again! Excellent look!!!! I think you look great! Nothing wrong with being pale. haha totally agree – but i was a little shocked seeing just how pale i really am! I love that skirt on you! Those red heels are killer. You look way taller than 5’3″ to me! Hi Jenn, I am Ada. I have stopped by before and complimented your awesome style and blog. You look lovely in all white with the bright red shoes which I love. The addition of the red lipstick was awesome, too. Loving the top you are wearing as well. I’d love for you to stop by my blog so welcome by. Have a great Monday. Love the pop of red with those shoes! I want to invite you to enter my blog’s #HopeForMoms Giveaway (total giveaway valued at $810!) All you have to do is write a #HopeForMoms status which will be shared with mom survivors of human trafficking through International Princess project. :D Check out more details at my blog! I love the details of this top! Oh my gosh, pale or not, it’s still so so cute!! I looove the red shoes with the all white. Totally inspired.